Discover true comfort when you take a seat in our Amish Pine Wood Roll Back Swivel Glider This Amish handcrafted pine glider chair has a swivel glider which offers ultimate versatility. 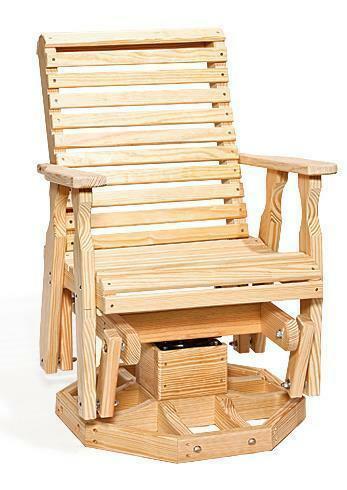 Order two pine glider chairs to transform your backyard living space. Sit back, relax and celebrate summer with new outdoor furniture from Dutchcrafters. The pine wood on this outdoor swivel glider is unfinished but you can order it to be stained so that it is protected in the outdoors. Some customers choose to stain our outdoor wood furniture themselves but we are happy to do it for you so that you can spend more time enjoying the summer season outdoors.